In his 110+-year-old family company, Ron specializes in restoration of historic and antique properties using period methods and tools. Much of Ron's woodworking knowledge comes from his progression through a formal apprenticeship to attain the rank of Master. Ron has done everything from pit-sawing trees to hand-building log cabins with mule teams to creating and aging historic restorations to match the existing structures, as well as building multi-million-dollar new-construction homes. He is credentialed to meet the strict standards for working on houses registered with the National Historic Trust, and has performed several period restorations. 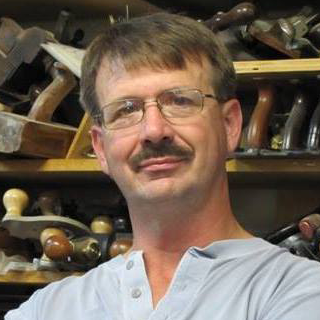 For many years, Ron has also been entrusted with the sharpening and fettling of significant tools from the collections of several prestigious tool collectors and dealers, and provides a tool sharpening and restoration service to the general public. The company mill is stocked with an extensive tool inventory, arranged and sorted by type. Ron can work as early as 1830, using period tools and methods. He maintains an extensive library and knowledge of tool catalogs, research and patents, dating back more than 100 years, and can type, catalog, and give details on hundreds of tools. Students at the Woodworking with Ron school have the use of thousands (seriously!) of company tools. Ron's shop is basically a working museum, except this collection is not for show - parts of it are used every day in the normal course of business. The best part of all is it is a true blended shop, and Ron has the expertise and skills to convey hos knowledge about all of these tools to those who are interested. Imparting knowledge is one of Ron's special skills. He's been instructing in one form or another on many different topics for more than 30 years. His delivery is engaging and fun, and he makes sure attendees go home with their heads and hands full!